Mike Allred has drawn and written about Superman, Spiderman and Wolverine, but now he's tackling a different realm of heroes and villains. The Oregon coast resident is adapting the Book of Mormon into a comic book series. "For me, it's the most exciting, most enlightening, most adventurous, most romantic, most powerful book in the world," he said. Allred himself is a Mormon with deep ties to the religious group's history. His great-great grandfather knew and worked with Joseph Smith, the founder of the Church of Jesus Christ of Latter-day Saints, and other relatives were torched out of their homes. Needless to say, Allred describes himself as "passionate" about his latest work, "The Golden Plates," the first issue of which currently is available. For most of his life, he's been something of a rebel. "Like most people who find faith, they find a way to find their best self," Allred said. "I never felt a greater sense of purpose," he added. Still, Allred worried about acceptance of the series. He said many people have attacked the series because they don't like Mormons. And many people consider comic books kids' fodder. "You say the word comic book and …" his voice trailed off. The medium, however, can convey beauty and sophistication, Allred said. "I believe this art form is significant enough to be given respect, and that it's significant enough to do something sacred," he added. So far, however, he's had nothing but support from the LDS church for his faithful adaptation. And the "Golden Plates" has been a commercial success as well. Allred and his wife, Laura Allred, who colors much of his work, cautiously released the first issue to see if there was enough support for the project. "We're getting reports of sellouts everywhere. We're about ready to go to a second printing," Allred said. Matt's Cavalcade of Comics in Corvallis has sold out its five or six issues of "The Golden Plates." "One person was buying it for someone in his church," said store owner Matt Ashland. "I was interested because I have friends who are Mormon, but I don't know much about the religion. Another guy was getting it because it was Allred. He's got a huge following," Ashland added. Allred is well known for his distinct drawing style and self-created titles, like "Madman" and "The Atomics." But he's also worked for industry giants like DC and Marvel, where he drew "X-Statix." That title, written by Peter Milligan, was miles away from a religious text. "X-Statix" was a superhero team whose members were as concerned about fame as surviving the bad guys. They got the rewards of rock stars and met grisly ends on the job. The series ended in a hail of gunfire, ala "Butch Cassidy and the Sundance Kid" or "The Wild Bunch." But the beginning of the end was a story that originally featured reincarnated royalty n Milligan brought Princess Diana back to life and put her on the superhero team. "On the surface it sounds crass and exploitive … The execution was brilliant and affectionate. I was moved. I thought it was powerful. He really gave tribute to this woman and reminded people why they loved her in the first place," Allred said. He had illustrated three of the six books in the storyline when Marvel blinked. The company was facing a meltdown from some shareholders and complaints from Buckingham Palace. So Princess Diana was killed again, and a generic pop idol replaced her. "It just devastated me," Allred said. He hopes that his work on "The Golden Plates" won't be prejudged in a similar fashion. In the wake of the Diana controversy, "X-Statix's" sales tanked. Allred knows that those heroes won't stay dead, even Dead Girl, if Marvel thinks there's a dollar to be made from them, though. "In the superhero world, there's always these ways to bring these characters back to life," he said. Still, Allred loves capes and masks, and he wish the genre had the power to move beyond its cliches more often. Allred said that his greatest influence is from films, and that his characters just happen to wear brightly colored tights. He's a big fan of some of the recent batch of comic book movies, such as the Spider-Man films and "Hellboy." His "Madman" series, which has a retro B-movie/pulp fiction feel, is being made into a film with Robert Rodriguez set to direct. Allred fell into comic books almost by accident, though he grew up reading series such as The Fantastic Four and drawing. While working as a U.S. Air Force television reporter in Germany, he was writing a screenplay, and decided to illustrate his own storyboards. At the same time, a friend was showing him great comics like "Watchmen" and "The Dark Knight Returns," a gritty Batman story by Frank Miller. The film project evolved into a graphic novel. Allred kept plugging away at comics and kept getting things published. Eventually, his hobby was paying him more than the Air Force was. He's been doing comics full-time since 1990. Allred's advice to aspiring artists of any medium is a Nike slogan. "Just do it. Don't talk about it. Don't think about it. Just sit down and do it. If you have a passion for it, you'll continue doing it, and eventually, somebody will say, 'I want that.' "
Kyle Odegard covers Philomath and rural Benton County. He can be contacted at 758-9523 or kyle.odegard@lee.net. Graphic novelist Mike Allred will appear at the Interzone Coffee House on Monroe Avenue on Saturday, Dec. 4, as part of the Linn-Benton Community College Valley Writers series. 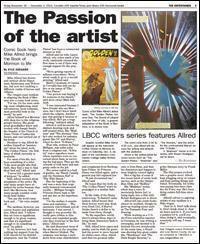 The event runs from 2:30 to 4:30 p.m., and Allred will discuss his writing and artwork with the audience. Allred is the author-artist for comic books such as "The Golden Plates," "Madman" and "The Atomics," and the artist for the controversial Marvel series "X-Statix." A "Madman" movie is in the works, with Robert Rodriguez set to direct.